Another day and some more photos for you. Go check them out and see what you're missing if you're not here. DragonCon Day 1 was quite a thing. It was busier and quieter than something like GenCon. Odd sort of thing. But yeah, Day 1 photos are up for your viewing pleasure. Hey everyone. 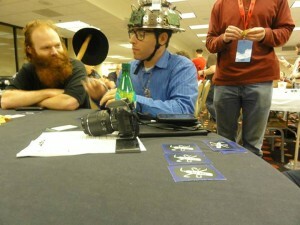 By the time you read this, I will already be gone... to downtown Atlanta for DragonCon. Much like GenCon a couple weeks ago, this will cause a disruption in regular news broadcasts, but I will be updating from the show. It's my first year going, so it should be an interesting time. Waning Gibbous Games just got their Kickstarter campaign for Larceny underway yesterday. They were kind enough to send me an advanced copy of the game to check out and share my thoughts about it with you. So let's take a look at this new party card game in this installment of TGN Reviews. The copy that Waning Gibbous (love that name) sent to me is pre-production, so I won't be commenting on the quality of the game contents since what I've got are not the final versions of things, but the gameplay is still the same. CoolMiniOrNot has posted up the Hadross stat cards for Wrath of Kings over on their Kickstarter page. Know what you're getting before you get it and try before you buy. 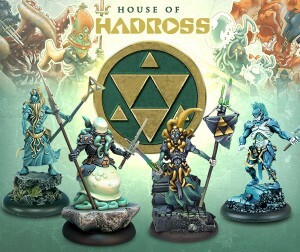 Having played the game for quite some time in playtest and such, I know you all probably think I'm biased, but that's fine, I still honestly love the game and can't wait to get specifically Hadross and Shael Han in my grubby paws. And here's the last of the Faction cards, this time for our wet friends. 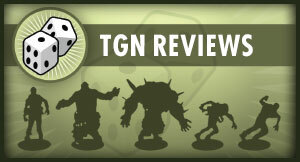 Fantasy Flight Games continues looking at the update of the Dark Heresy Second Edition Beta in this next update. Welcome to Week 3 of Dark Heresy Second Edition Beta Playtesting! Every Wednesday, we will post a weekly update to keep you informed about the progress of the beta. 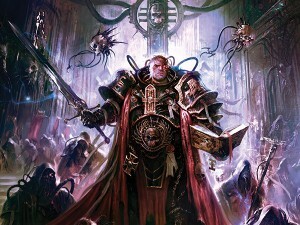 This post will include any big news involving the beta, guidance on where we would like you to focus your attention in the coming week, and a PDF update to the beta document to keep you informed of the most recent tweaks and changes to the Dark Heresy Second Edition core rules. This week’s update (pdf, 12.7 MB) can be found on the beta support page and includes new items (in red) as well as all the previous updates to the beta. Additionally, there is a dedicated thread in the Game Mechanics forum in which you can discuss any feedback directly related to this week’s update. As always, you can email us directly at darkheresybeta@fantasyflightgames.com to best ensure we see your feedback too. As a reminder, when you submit your feedback via e-mail, it is most helpful to us if you consolidate multiple questions and comments into a single message, rather than sending a separate e-mail for each question or comment. Acheson Creations has posted up the intro video for their upcoming Super Robot StratoMaxx Kickstarter campaign. The Ion Age gets on their bike and rides with the new release of the Canthus Monocycle. With what we know now the loss of the Brightening Star should not have happened but then we were only beginning once more to face an enemy that our long dead forefathers had through banished forever. The Fleet did not arrive in Camarthen space for many months after the loss of the Belkus Labyrinth. It took time to gather the knights and their musters while thinking always of the threat posed by the Marcher Barons. But we did not stand idle. Perhaps we should have. Lectus Bowar led his retinue of a hundred Starvaulters and fifty thousand of Prydia on a rapid strike again the fledgling Khanate. The Brightening Star was one of forty Cassillis class Portable Castles that landed in the vicinity of the ruins of Pelcan city. She was not the only one lost but she was prime in the failure of the containment campaign. 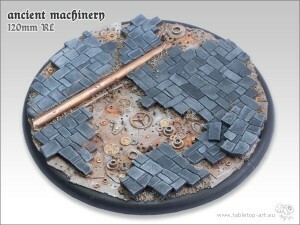 Tabletop-Art has their new 120mm Ancient Machinery base now available over in their webshop. Dust Day is happening next month in Bologna. Will you be going? The first Dust Day will take place in Bologna on September the 7th. Tournament, demo and the opportunity to meet Paolo Parente. 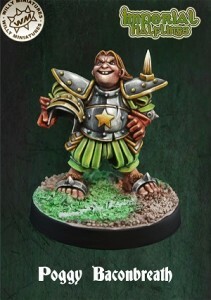 Willy Miniatures has a photo up of their new star player for the Imperial Halflings team on Indiegogo. Say hello to Poggy. Last update from Willy Miniature's Imperial Halflings crowdfunding: Poggy Baconbreath, painted. 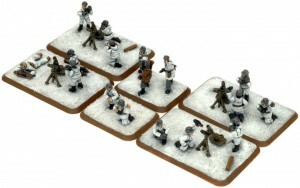 Battlefront has more winter wonderland goodness for you with their winter gear Mortar Platoon for Flames of War. During the Winter War (30 November 1939 – 13 March 1940), the 81mm mortar played a vital role due to a lack of field artillery that plagued the Finnish Army throughout the conflict. The 81mm mortar was able to breakup Soviet infantry attacks due to its surprising effectiveness even in deep snow; due to the sensitive fuses that were fitted to the projectiles. However, field artillery they were not and proved less effective against bunkers and reinforced dugouts. During the Continuation War (25 June 1941 – 19 September 1944) the number of 81mm mortar in Finnish service peaked but the attrition of war meant a steady decline in the numbers available. Any captured Soviet 82mm mortars were quickly turned against their former owners but the demand for the 81mm mortar was far in excess of what was available. CorSec Engineering previewed these a couple days back. Well, now they've launched their Kickstarter campaign in order to fund their new 28mm sci-fi terrain pieces. 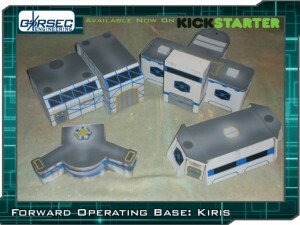 Forward Operating Base: Kiris is now funding on Kickstarter! 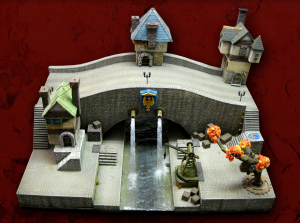 This laser cut 28mm Sci Fi Terrain features new techniques to overcome the limitations of regular MDF terrain. Finally some laser cut Sci Fi terrain with curves! Sally 4th knows you gotta move your paints around every now and again and has created trays for it. This week’s new releases from Sally 4th are a set of storage cases for model paints. The cases are fully compatible with our Warchest Figure Storage system, so the same standard or clear Perspex lids can be used with them. 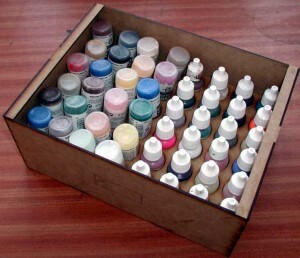 The cases are robust and stackable and allow for a good quantity of paint to be stored in a small space. As you can see from photos, I can’t decide if it is better to store jars and bottles upside down, or the right way up...either option is possible. All paint storage cases include an appropriate insert which is set at a suitable height for paints being stored. Cases require assembly with PVA wood glue. Designed to hold 24 of the current Games Workshop / Citadel Paints. Also works for Humbrol Enamels. Designed to hold 35 Wargames Foundry / Coat d'Arm / Original Citadel Paints. Designed to hold 48 Vallejo or Army Painter bottles of paint. 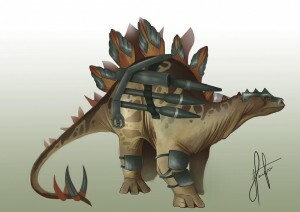 Dino Wars knows what people want from their dinosaur minis games... more dinosaurs! So they're delivering. Hey all, after working with our suppliers we are now able to supply an additional 3 dinosaurs for the same kickstarter goal! Triceratops, Velociraptor and Stegasaurus have now been added to the kickstarter price list! 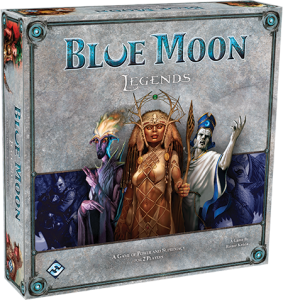 Fantasy Flight Games has another new game on the horizon with Blue Moon Legends. 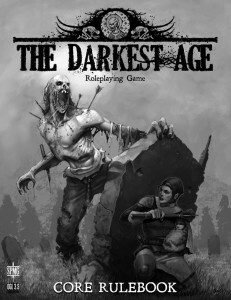 Spectacle Publishing Media Gaming Group has announced a new alternate history/horror RPG they're coming out with called The Darkest Age. Spectacle Publishing Media Group (SPMG), an independent book publishing company today announced its first roleplaying game, The Darkest Age (DA). This innovative horror roleplaying game is set in a gritty and dangerous 14th century Europe as an unusual strain of the bubonic plague ravages the countryside and those afflicted won’t die. Instead, they rise up and feast on the living! Based on the d20 OGL system, The Darkest Age takes players into a grim world of corruption and fear, plagues and paranoia. Wars are no longer fought with masses of men in chain with bows and spears – they are fought through resources, specialists and powder-keg skirmishes. 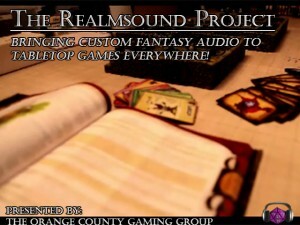 Orange County Gaming Group revamped their Realmsound Project and relaunched over on Kickstarter. They've already more-than-funded on just the first day, so it's stretch goals for the next 40. Hey gamers OCGG is back and we have some very exciting news, our Realmsound Kickstarter Project 2.0 is underway!! This time, however, we have re-tooled our project and have been funded in just 1 day, can you believe that! It's all thanks to YOU that we made it this far. Now we are going for the gold and asking you to help us make more gaming history by helping us bring even MORE fantastic custom audio to table-top gaming. Visit our link and donate whatever you can so we can breathe life back into our favorite past time. 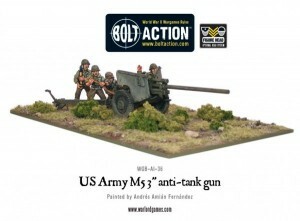 Warlord Games gives the Allies some tank-punching-power with the release of their new American 3" anti-tank gun M5. S forces can now decimate enemy armour with this newly released anti-tank gun! Designed in 1940, the M5 3? anti-tank gun combined the barrel of the 3-inch anti-aircraft gun T9 with the breech, recoil system and carriage from the 105 mm howitzer M2. Though heavy to manhandle, it gave US crews significantly better anti-tank capabilities than previous guns. Usually towed by M3 half-tracks, the M5 was mainly assigned to Tank Destroyer battalions, seeing action in North-West Europe and the Italian campaign. Waning Gibbous Games has launched a Kickstarter campaign for their new party card game, Larceny. They've sent me a preview copy of it. Expect a review posted up later tonight. 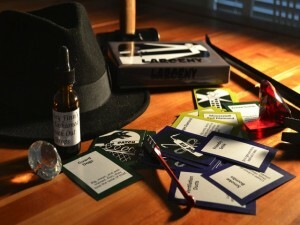 Larceny is a fast paced party game where you and your friends plan one heist after another. Each round a different player is the Chief and decides which solution is best to overcome the inevitable catch in your perfect plan. 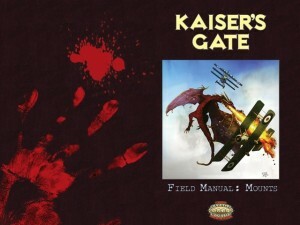 Battlefield Press is in their final days on Kickstarter for their Field Manual: Mounts for their Field Manual: Mounts for their Kiaser's Gate setting that uses the Savage Worlds RPG system. Welcome to the newest Savage Worlds expansion to the ever popular Kaisers Gate (an alternate history World War I setting created by Mike Lafferty). This book was spun out of the need for expanded material, and this manuscript, penned by Bill Ogden, evolved into a book about how mounts can make a big difference in the Great War. It takes items alluded to in the original Kaisers Gate and makes them a reality. The manuscript is completed and so is layout. The book is finished. The only thing we need to do is add a page with the names of all the project backers, which we will do at the close of the project. If you pledge at the PDF level, you can expect a copy of your PDF within a couple of weeks of the close of the project, and while it says October for the release of the printed book, it is more likely than not that backers will start receiving their print books before that estimated date. WizKids continues their previews of the Classic TV Batman set for HeroClix with a look at Shame. Boy howdy! Today’s DC HeroClix: Batman Classic TV preview takes us to the Old West, where we visit with a bloodthirsty buckaroo who breaks the rule that bad guys only wear black hats. We’re pleased to present to you the Conniving Cowboy of Crime, Shame! 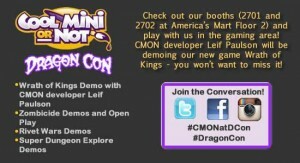 CoolMiniOrNot will be headed downtown this weekend for DragonCon. I'll be there. Stop by both our booth and our demo area and say hello. 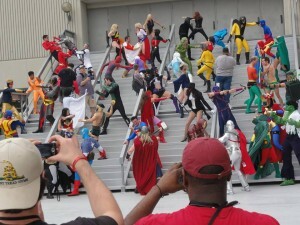 Who's excited about DragonCon??? We are!! Make sure you stop by and say hello (and play some games)! Catalyst Game Labs has announced that they'll be running a Leviathans Kickstarter this fall in order to expand the game. We know how to make books. I like to joke that we can fall out of a bed and stand up with a book in our hands. However, with Leviathans we tackled a slew of new manufacturing items we’d never dealt with before. It would have been bad enough to have even one of those additional elements on the table, but we went ahead and tried to tackle a dozen at a time. Where does that leave us since Leviathans published late last year? Well, it pretty much sold right out when it published. Which is fantastic! However, the way in which we packaged the game makes it unsustainable (again, that learning curve). As such, we need to find a new way to repackage the line so it can sustain itself. We are currently looking at reshaping the entire line into something similar to how Sails of Glory/Wings of Glory (as well as Star Wars: X-Wing or Star Trek: Attack Wing) package and release their games and miniatures. This would in effect be a re-launch for the game.